I visited Rendville, OH for the first time in September 2005. It was Emancipation Day; booths with old photographs and memorabilia lined the street, kids were running up and down Main Street filling the air with the sounds of laughter, and the adults were milling about sharing stories and reminiscing. Being surrounded by people who looked like me made me feel welcomed, like I was with my own aunts and uncles. Over the years this sense of familial connection stayed with me, igniting a desire to learn more about this small town that left such a lasting impression on me a decade ago. 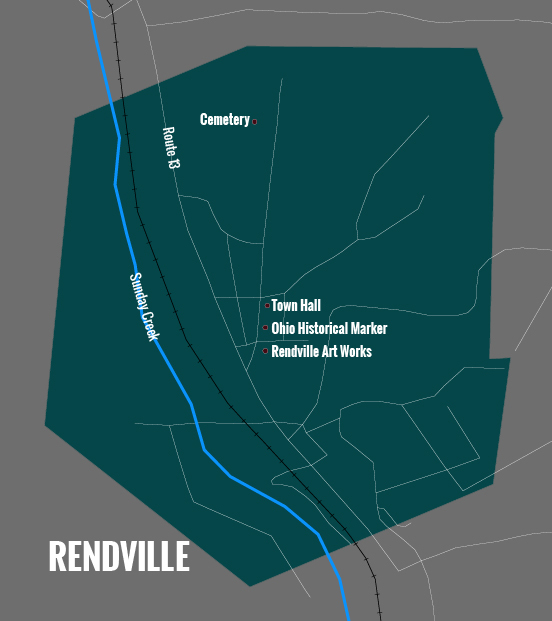 This map shows Rendville's city limits and notable landmarks, including the town hall, cemetery, and the town's historical marker. Rendville is located along State Route 13 in Monroe Township, Perry County. The Village of Rendville still stands as a testament to opportunity and racial equality at a time and place where such things were unheard of. It was established by the Ohio Central Coal Company in 1879 and incorporated on May 2, 1882. At its most populous, more than 2,000 people made their homes there. Today, according to the 2010 Census, it is the smallest incorporated town in Ohio, with a population of 36 residents. Rendville was named for William P. Rend, an Irish-born industrialist who, in the 1870s, hired large numbers of African-Americans to work alongside Europeans in the coal mine, an unheard of practice at a time when people feared that an abundance of African-American labor would drive down workers’ wages in the region. Rend resisted the tradition of closing his doors to blacks and hired them anyway. When the coal mines went bust in the 1930s and people moved away in search of other work, the impact on mining towns like Rendville was devastating. People who could go north to the factories of Cleveland, Akron, and other places did, where wages were better and more secure. Bird’s Eye View of Rendville. Photo provided by the Little Cities of Black Diamonds Council. Main Street, 1906. Photo provided by the Little Cities of Black Diamonds Council. Mine No. 268; Photo provided by the Little Cities of Black Diamonds Council. Sophia Margaret Mitchell was the nation’s first African-American woman mayor. Published in the Times Recorder, Tuesday, February 27, 2007. Roberta Preston was the first African American woman in the U.S. to be appointed as a postmaster. Photo provided by Jean Harris. The construction of Ohio State Route 13 in the late 1930s divided the town and resulted in the destruction and removal of half its buildings. Evidence of Rendville’s former size is gone forever, removed by the construction crews that built the road. Many of the other buildings in the area were lost. However, the Rendville Baptist Church was saved and moved over. It is now The Rendville Art Works. Cheryl Blosser, historian for the Little Cities of Black Diamonds Council in Shawnee, OH, said many towns like Rendville were formed around coal mines. The mines were the sole reason the towns existed. 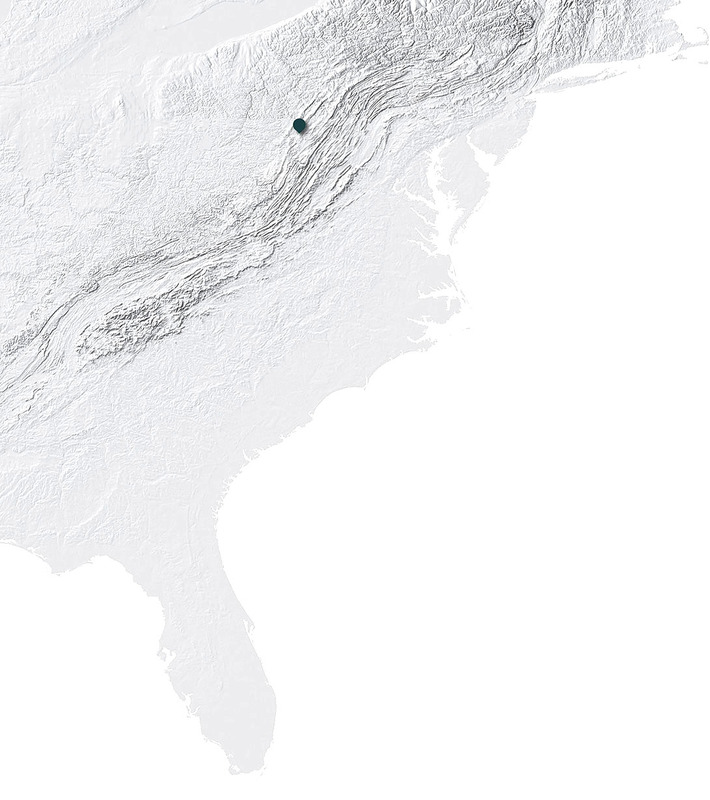 As a result, many of these coal towns are gone and exist only as dots on old maps. Rendville welcomed African-Americans, many of whom not only lived in the community but served it as well. Notable names include: Richard L. Davis, a leader in the Knights of Labor and the United Mine Workers of America; Sophia Mitchell, the first African American woman mayor in Ohio; and Roberta Preston, the first African-American woman postmaster in the United States. Adam Clayton Powell Sr. spent time as a miner in Rendville before moving on to develop the Abyssinian Baptist Church in Harlem, the largest Protestant congregation in the country. Members of the Rendville Historic Preservation Society examine the donated building they plan to renovate to become a museum, visitor center, and coffee shop. In October 2010, an Ohio Historical Marker was unveiled to commemorate the story of Rendville and its significance in Ohio history as a place that African-Americans broke the color barrier. The marker stands beside the Town Hall on Main Street. Dr. Frans Doppen, chair of the Department of Teacher Education at Ohio University was, along with his students, instrumental in making it happen. Over a three-year period, students organized fundraisers to pay for the marker. 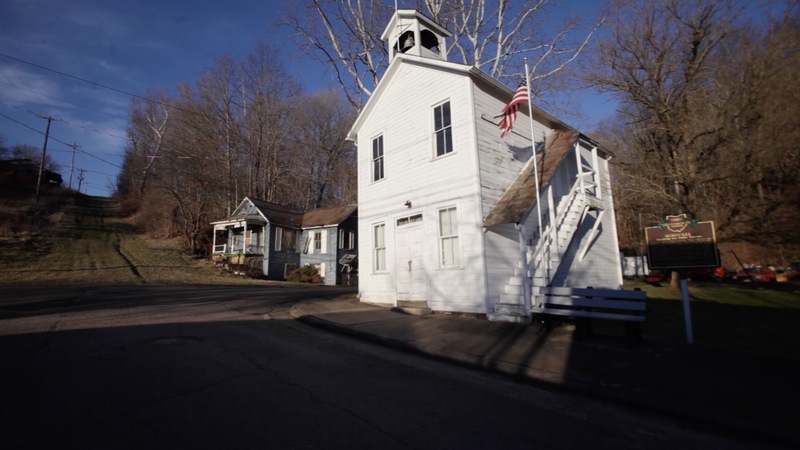 “Rendville is a little piece of history that needs to be saved,” Doppen said, adding that Rendville’s location right off Route 13 provides people with an opportunity to learn more about the African-American history that took place there. Founded in July 2015, the Rendville Historic Preservation Society (RHPS) reestablished the Emancipation Day celebration in September which commemorates President Abraham Lincoln issuing a preliminary Emancipation Proclamation on Sept. 22, 1862, which set more than three million black slaves free. The RHPS is also working to renovate a donated coal mining house and turning it into a museum, coffee shop and visitor center. It will be located on Main Street and people who visit can learn about Rendville’s rich history. It is this dedication to making sure this history doesn’t completely vanish that gives me lasting hope for this little town. For me, it isn’t just about keeping the history of Rendville alive for people that lived there, it is about preserving a little piece of the collective history of us as Americans.